2018 was an eventful year. 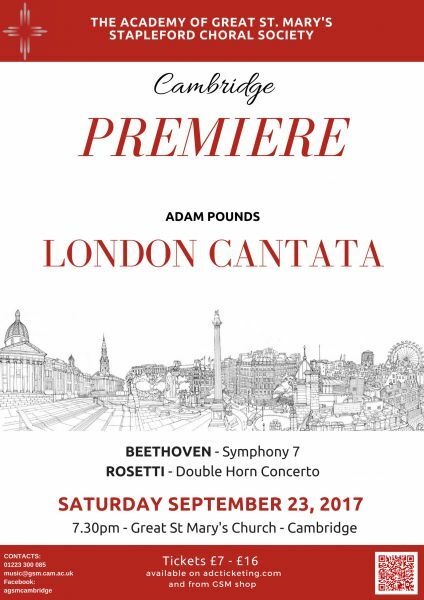 In September I recorded both my London Cantata and my first Symphony . The latter work was composed in 1985 and I have revised the work twice. The present version is now available on my latest disc and as a download from all the usual outlets. I am now working on my second symphony and as I write, I can confirm that the first movement is complete. This is a very rhythmic movement full of driving motifs and opportunities for the different sections of the orchestra to excel. To this end, it contains little in the way of solos but concentrates on the families of instruments. However, the slow movement will feature a solo saxophone. I’ve conducted a number of concerts during the year. The Stapleford Choral Society continues to develop and this term we will be performing Haydn’s Heiligemesse on Saturday 23rd March. The Academy of Great St. Mary’s has also had an interesting and varied year. In September, we performed the Divertimento by Lennox Berkeley as part of our programme. This is an excellent piece in four movements and I have written an article about this work which is being published in the Lennox Berkeley Society Journal. It will then be available on my website. My next concert with the Academy of Great St. Mary’s is on Saturday 16th February 2019 and will feature Beethoven’s second symphony and the ‘Pulcinella’ suite by Stravinsky. — John France, Musicweb International. You can read the full review of my latest disc on Music Web International. As a Londoner, I have always been fascinated by the city’s history and life and after the composition of his London Festival Overture for the Waltham Forest Arts Festival (commissioned by Greater London Arts), it was only a matter of time before I would set some London poetry to music. 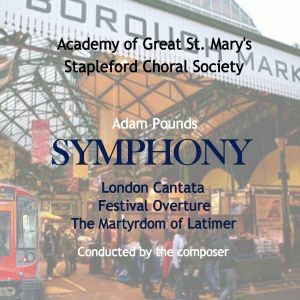 This piece was especially composed for the combined forces of the Academy of Great St. Mary’s and the Stapleford Choral Society. The work is scored for a standard symphony orchestra, S.A.T.B. choir and a baritone soloist. The piece opens in celebratory mood setting the words of William Dunbar a 16th century poet and the music has traces of Walton’s influence in it. However, it isn’t long before the music turns to a more reflective mood and we hear the words of George Eliot’s In a London Drawing Room. This really explains the idea behind the work in that we scratch the polished veneer of the great city and we find a vast array of lifestyle, history opulence and poverty. The solo baritone conveys the loneliness that can be experienced even in a crowded environment and he plays his part as the ghost in Shadwell Stairs by Wilfred Owen and also features in Upon Westminster Bridge by William Wordsworth. Between the Wordsworth and the Owen I have inserted a short orchestral interlude. The theme of this is based on the famous Westminster Chimes. This is appropriate as the chimes although strongly associated with London were composed in 1793 for a new clock that was installed in Great St. Mary’s, Cambridge. The piece concludes with the words of the Amy Levy who was the first Jewish woman to study at Cambridge University. Her evocative poem A March Day in London provides some beautiful descriptive lines. I was very busy in 2016 with a number of concerts and projects. In January, my violin sonata was performed in Cambridge by David Richmond and David Silkoff and well received. Following on from this, the Academy of Great St. Mary’s gave a performance that included Haydn’s ‘Drumroll’ symphony, Dvorak’s Czech suite and Bartok’s Romanian Dances. I was also busy at this time overseeing the recording of Lennox Berkeley’s Stabat Mater at Aldeburgh. The disc is now available and well worth a listen. The main work in the AGSM concert in the summer was the fourth symphony by Brahms. The programme also included a performance of my Life Cycle. This was very exciting as the work employs a large percussion section. Perhaps the highlight of 2016 was the opportunity for me to work with the international violinist Chloë Hanslip again. 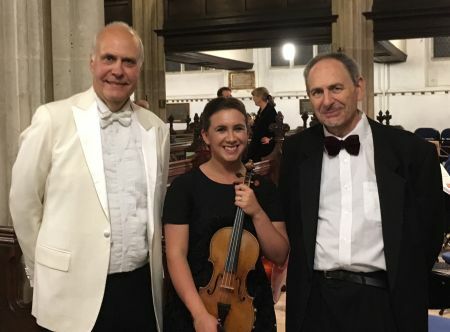 We were very pleased that she returned to give a stunning performance of Saint-Saen’s third violin concerto with David Richmond (leader). We were performing to a capacity audience in Great St. Mary’s and they were keen to show their appreciation. The orchestra also gave a lovely performance of the New World Symphony by Dvorak. The Stapleford Choral Society are also making great progress. 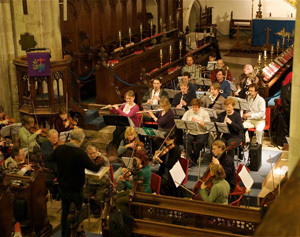 We have boosted our membership and found that concerts in Sawston near Cambridge have proved to be highly successful. In the last couple of months the choir was very busy rehearsing for Christmas and recording their first CD. The audio extract here is of their performance of Angelus ad pastores ait by Andrea Gabrieli. We managed to sell 108 CDs very quickly! I am very busy composing a work for choir, baritone soloist and orchestra at the moment. My London Cantata uses the words of famous poets including Owen, Blake, T.S.Eliot and Wordsworth. It is proving quite a task and I’m hoping that it will be ready for its first performance in the summer. A great deal has happened since I last published my news. 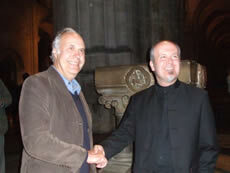 Most recently, I have been elected as chairman of the Lennox Berkeley Society. I am very pleased to take up this position and as a former student of Lennox it lets me give something back. Together with the committee we will continue to promote the music of this great English composer. I will be involved in project managing a recording and concert performances of Berkeley’s Stabat Mater. The recording will take place in Aldeburgh with a performance at Blythburgh church followed by performances at the Cheltenham and Spitafields festivals. 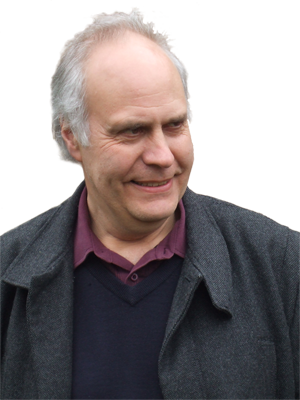 The performers will be the Marian Consort and the Berkeley Ensemble conducted by David Wordsworth. I have also been busy conducting and performing as well as preparing my music for sale or hire. Back in December I conducted a performance of my Festival Overture together with Beethoven’s 5th symphony and the beautiful Masques et Bergamasques suite by Faure. I have revised the Festival Overture by developing the final section and re-scoring part of it. It is now available in two versions. One has reduced percussion but with the addition of a piano part. In March, Dinah and I gave a recital at St. Bride’s church in London which was well received. Our programme was mainly Baroque on this occasion. 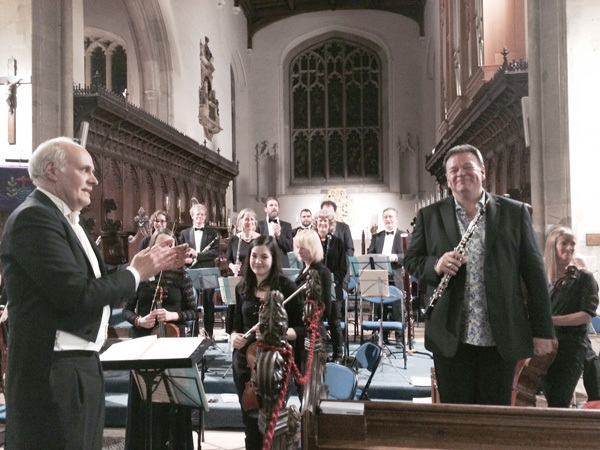 The highlight in March was conducting a concert featuring the oboist Nicholas Daniel. Nicholas gave a beautiful performance of the Strauss Oboe Concerto and it was really interesting working with him. He was well supported by the Academy of Great St. Mary’s who played with focus and enthusiasm. I’m looking forward to my next concert on the 6th June when I will be conducting one of my favourite works – the Fifth Symphony by Vaughan Williams. The programme will also include the Serenade for Strings by Elgar and Weber’s exciting Oberon overture. Closely following this, I will be conducting the German Requiem by Brahms with the Stapleford Choral Society. September has been a very busy month. The first performance of my Clarinet Quintet was given by the Goldfield Ensemble at the Granary, Stapleford. The concert also included works by Milford, Finzi and Brahms. The Goldfields gave a great performance of my new work and I am pleased to say that it was greatly appreciated by a capacity audience. I hope to record the work in the future together with other pieces of my chamber music including the Sextet, the Wind Quintet and my Third String Quartet. In the meantime, you can hear two preview samples of the Clarinet Quintet here. At the end of September, I conducted a performance of the fourth symphony by Bruckner. This is an amazing work and the Academy of Great St. Mary’s gave a powerful account of the work. The concert also included my Martyrdom of Latimer. This work was composed as a result of commission in 2009 and first performed in Ely Cathedral. It is a programmatic piece that focuses on the life and death of the cleric Hugh Latimer. This was also very well received and the work features on the CD Resurrection. I have just conducted a fully staged performance of The Soldier’s Tale by Igor Stravinsky at the Stapleford Granary. This is a fascinating but difficult work but the performers rose to the occasion and it was a very enjoyable evening. I am now looking forward to the Christmas period with several concerts taking place. I will be conducting the Stapleford Choral Society on the 1st November in a programme that includes music by Bruckner, Brahms and Schubert as well as the Foundling Hospital Anthem by Handel. On the 16th November I will be conducting a Baroque programme in Great St. Mary’s, Cambridge and this will be followed by a concert on the 7th December that will include Beethoven’s fifth symphony and my Festival Overture. My final concert before Christmas will be on the 20th December when I will be conducting excerpts from the Christmas Oratorio by Bach, music by Monteverdi and carols. The concerts that took place in December proved to be very successful and in particular, the orchestra of The Academy of Great St. Mary’s performed very well in The Variations on a theme by Haydn. The highlight, however was in March when the orchestra performed to a capacity audience. The featured work was the Brahms violin concerto with Chloe Hanslip as soloist. Chloe performed magnificently bringing great maturity of style to the work. The orchestra supported her well and I received many positive comments in this respect from the public. Chloe has promised to return and I hope to perform the Barber violin concerto with her. 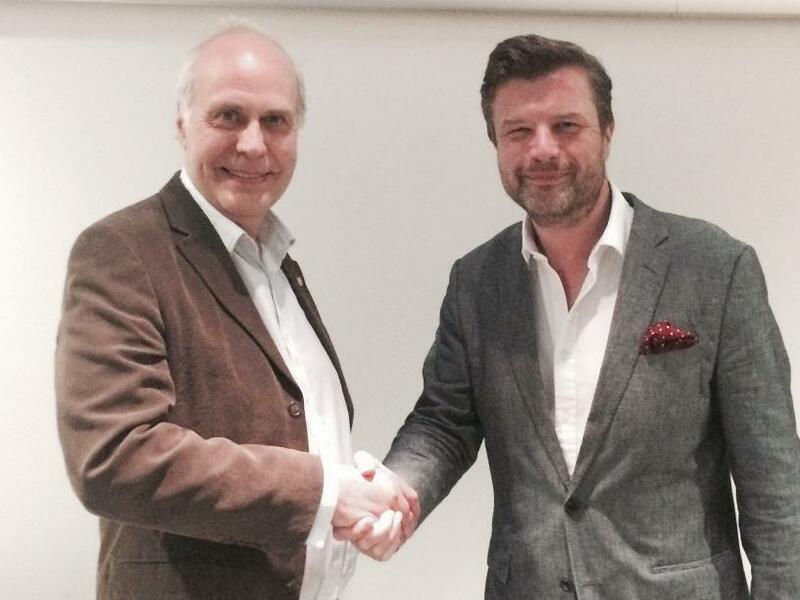 I was also fortunate to be able to interview Stephen Cleobury. Stephen is the Director of Music at King’s College Chapel, Cambridge. He gave some very interesting insights into the music of Lennox Berkeley and the use of technology. My article will be published in the 2014 Lennox Berkeley Society Journal and is also available here. There are more dates on the concert calendar including performances of more contemporary pieces such as The Soldier’s Tale by Stravinsky and the Sinfonietta by Lennox Berkeley. I also continue to give flute and guitar recitals with Dinah and after a successful performance at St. Bride’s, Fleet Street we will be returning there in March 2015. My most recent composition is a Crucifixus and this will be performed on Good Friday at the University Church, Cambridge. I am presently working on a Clarinet Quintet that will be performed by the Goldfield Ensemble in September. Since I last reported, many events have taken place. Most recently, The Academy of Great St. Mary’s gave a wonderful performance of my Gaelic Triptych in September. I have updated the work and it was well-received. My new wind and piano sextet had its first performance in May and I now have plans to record this together with other chamber works for release in 2014. Flute and Guitar recitals have become a regular feature of my work and we have another three planned for November and December. In 2012, I arranged three movements from Lennox Berkeley’s Five Short Pieces for Piano op.4 and these have proved popular with audiences. You can hear them on this website or by visiting www.lennoxberkeley.org.uk. These pieces also feature on our new CD Entr’acte details of which can be found here. I continue to be very busy with my conducting engagements with the Academy of Great St. Mary’s and the Stapleford Choral Society and as Christmas approaches the diary is looking very busy. Please look at my events (concert calendar) page for information. During the year I have presented several courses on the history of music at the new arts centre at Bury Farm, Stapleford. The course Journeys In Music gave an overview of the development of music from the Baroque to the early twentieth century and the other one Music In Our Time concentrated on English music of the early twentieth century. Dinah and I will be giving a recital at Bury Farm on the 11th December. It is an interesting place and their website is worth a visit at: www.staplefordgranary.org.uk. 2014 looks like being another busy year. As well as many other playing and composing engagements, I will be having the pleasure of conducting a performance of the Brahms violin concerto with international soloist Chloe Hanslip in Cambridge on the 22nd March. A great deal has happened since my last news update. 2012 proved to be a very productive year and I am pleased to report that both the orchestra and choir that I conduct have both developed tremendously. Last March, I conducted a performance of the Concerto for Orchestra by Bartok and this went very well. Other 20th century works included the Pulcinella suite by Stravinsky. The choir gave an interesting concert in June that included a performance of extracts from Les Indes Galantes by Rameau as well as the Requiem by Faure. In September, I was particularly pleased to be able to include a performance of my Violin Concerto with David Richmond as soloist. We dedicated the performance to the late Keith Gurry who was a good friend to both David and I. Keith was a long time member of the BBC Symphony Orchestra and I originally composed the concerto for him. During last year, I gave the piece a complete overhaul and there are plans to record it soon. Compositions this year have included a new carol, Veni, redemptor gentium that was performed at Great St. Mary’s, Cambridge in December and I have just completed a Sextet for flute, oboe, clarinet, horn, bassoon and piano for the Berkeley Ensemble. I have also started giving recitals with my wife Dinah, who is a flautist on a regular basis. We have given four in the last few months and three of these were in Cambridge. The last one, in December was in the church of St. Anne and St. Agnes in the city of London where we gave the first performance of Three Pieces for Flute and Guitar by Lennox Berkeley. I arranged these pieces from the Five Short Pieces for Piano Op.4. They worked well and we have recently recorded them. Our new Flute and Guitar website is now online, and we have already planned a number of recitals this year. Thursday 14th July saw the premiere of my latest work Time , a set of three songs for baritone voice, flute, viola, piano and percussion. I must extend my gratitude to the performers who gave an excellent account of the work that was very enthusiastically received by the audience. It has been requested that there should be another performance before Christmas and this should happen in November. The song cycle has been recorded so it should be available before too long either as a download or CD or both. My Norfolk Seascape for flute and chamber orchestra was also well-received and Dinah Pounds gave a compelling performance of the work in two concerts in Cambridge. This composition was 'lighter' in style (compared with Time ) and has a strong melodic basis. It is also the first time that I have incorporated the harp into my scoring and I found that the combination with the flute together with a small orchestra (strings, solo wind, two horns and timps) just the right balance to 'paint' a picture of the Norfolk coastal landscape. This work has also been recorded. I will be busy again in the next season when I will be conducting performances of the Concerto for Orchestra by Bartok and The Dream of Gerontius amongst many other works. The new CD, Resurrection , has been well received and I am now planning a new recording of smaller-scale works that should be released next year. Please read the full review by John France. I have two major concerts in June. On the 11th (7.30pm), I will be conducting the Academy of Great St. Mary's at the University Church, Cambridge in a performance of the Enigma Variations by Elgar and the programme will also include the first performance of Norfolk Seascape . This is a rhapsody for solo flute and orchestra. I composed the work for my wife Dinah who will be the soloist. Like most of my music, the piece is programmatic and the opening represents the coast at Thornham in its tranquility and timeless beauty. This is one of our favourite places. There will be a second performance of the work on the 25th June at the Emmanuel United Reformed Church, Trumpington Street, Cambridge (7.30pm) when I will be conducting a concert that will include two choral pieces by Vaughan Williams - the Serenade To Music and Toward The Unknown Region . I do hope that you can come to one or both of the concerts. I have just finished composing a piece for voice, flute, viola, piano and percussion. The composition is called Time and I have set the words of Blake, Shakespeare and Shelley. This will be performed on July 14th (7.30pm) in Michaelhouse, Trinity Street, Cambridge. The evening will also feature other music and poetry readings on the subject of time. I am now busy planning for the new season when I will be conducting some great music including the Concerto for Orchestra by Bartok. 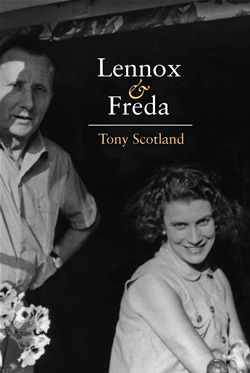 Lennox & Freda , Tony Scotland's revealing new book about the lives of the composer Sir Lennox Berkeley – with whom Adam studied composition – and his wife Freda Bernstein, was published in November by Michael Russell. More than a biography, this is a portrait of an unconventional marriage and a record of Berkeley's generation and a vanished way of life. Drawing on his own original research, Tony Scotland presents fresh perspectives on the Oxford of Auden and Waugh; the Paris of Stravinsky, Diaghilev and Poulenc; Somerset Maugham's set on the French Riviera; Dylan Thomas, William Glock and Humphrey Searle during the Battle of Britain; Eddie Sackville-West, Tippett, Bliss and Boult at the BBC; and Britten and Pears at Aldeburgh. Find out more, and buy online, at www.lennoxandfreda.com. The concert given by the Academy of Great St. Mary’s on June 12th was very well received. The programme was varied and included the third performance of The Martyrdom of Latimer where the University Church proved a great venue for accommodating the two off-stage trumpet parts. The players were sited in the two galleries and the effect was exciting and stereophonic. The second half of the evening was taken up by a performance of Beethoven’s Eroica symphony. This massive work demands a great deal from the musicians and concentration and artistry were there throughout the performance. The orchestra was formed in 2007 and it has already developed tremendously, taking on some of the ‘trojan horses’ of the repertoire. There is an exciting season ahead that will include performances of the fifth symphony of Shostakovich and Elgar’s Enigma Variations . 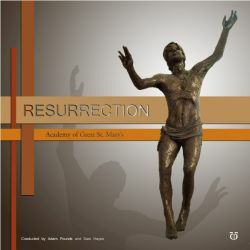 A CD Resurrection that features The Academy of Great St, Mary’s along with the GSM choir will be released soon, and it features my Martyrdom of Latimer and Life Cycle as well as works by Finzi, Elgar and Howells. This short video clip (left) features The Academy of Great St. Mary’s performing the second movement from the Eroica by Beethoven. The second performance of The Martyrdom of Latimer took place on 20 March in Cambridge, including a performance of Brahms' German Requiem . During the previous few weeks the Academy of Great St. Mary's was involved in some very intensive recording sessions for their new recording Resurrection which will include the Martyrdom of Latimer , Life Cycle , pieces by Elgar and Lennox Berkeley and Lo, the Full Final Sacrifice by Finzi. The vocal works feature the choir of Great St. Mary's under the direction of Samuel Hayes. The evening was marked with a first performance of a work especially written for the occasion: The Martyrdom of Latimer by Adam Pounds who was present in the audience. The warmth and enthusiasm the audience showed towards this piece was certainly warranted. This profound work explored the excitement and darkness of death and spiritual revival. After the opening appealing melody was taken up in turn by the different sections of the orchestra, the toll of impending doom heralded the contrasting development of dramatic conflict, building up to an exciting climax with trumpets off-stage broadening the experience until the work's final thunderous drum call brought this fine composition to a memorable close.